Jeff Scott Soto (ur. 4 listopada 1965 w Nowym Jorku) - amerykański wokalista. 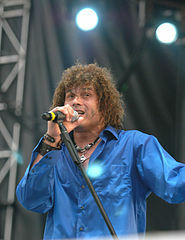 Soto współpracował z takimi wykonawcami jak Yngwie Malmsteen, Axel Rudi Pell, Eyes, Talisman, Takara, Humanimal, Human Clay, Kryst The Conqueror, Redlist, The Boogie Knights oraz Soul Sirkus. ↑ GUS G. Taps Singer GUS G. Taps Singer JEFF SCOTT SOTO For West Coast Tour (ang.). www.blabbermouth.net. [dostęp 2016-02-27]. ↑ Encyclopaedia Metallum - Jeff Scott Soto (ang.). www.metal-archives.com. [dostęp 2016-04-24]. ↑ Encyclopaedia Metallum - Yngwie Malmsteen (ang.). www.metal-archives.com. [dostęp 2016-04-24]. ↑ Encyclopaedia Metallum - Axel Rudi Pell (ang.). www.metal-archives.com. [dostęp 2016-04-24]. ↑ Encyclopaedia Metallum - Kryst the Conqueror (ang.). www.metal-archives.com. [dostęp 2016-04-24]. ↑ JEFF SCOTT SOTO: 'Beautiful Mess' To Receive European Release In February (ang.). www.blabbermouth.net. [dostęp 2016-04-24]. ↑ Jeff Scott Soto – Live At Firefest (ang.). www.discogs.com. [dostęp 2016-04-24]. ↑ JEFF SCOTT SOTO: 'Damage Control' Details Revealed (ang.). www.blabbermouth.net. [dostęp 2016-04-24]. ↑ GUS G. Releases 'Blame It On Me' Video, Announces West Coast Dates (ang.). www.blabbermouth.net. [dostęp 2016-02-27]. ↑ Encyclopaedia Metallum - Gus G. - Brand New Revolution (ang.). www.metal-archives.com. [dostęp 2015-09-07].